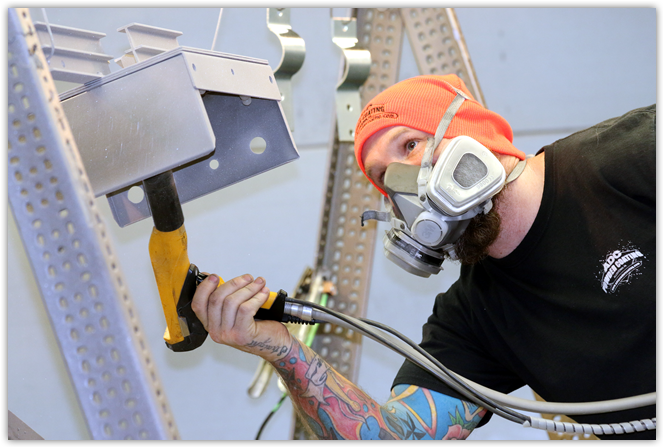 At ADC Powder Coating we cater to small to medium powder coating projects as well as projects that require special handling or secondary services in the Lehigh Valley. We are conveniently located right off of Route 78 in Allentown, PA (Lehigh Street exit). ADC Powder Coating utilizes a batch type process with an 8' x 15′ oven and spray booth, rather than a high speed high capacity conveyor type system. Utilizing a batch process allows us to do one or two parts more economically that conveyor type powder coaters. ADC Powder Coating is also a full service facility, we not only offer media-blasting, steam cleaning and phosphating services, we also have a full metal fabrication and welding shop including CNC plasma cutting. So not only can we powder coat your parts, we can design and fabricate them for you as well. As part of a 95 year old Allentown based manufacturing company, we pride ourselve on knowing what it takes to provide top notch customer service .